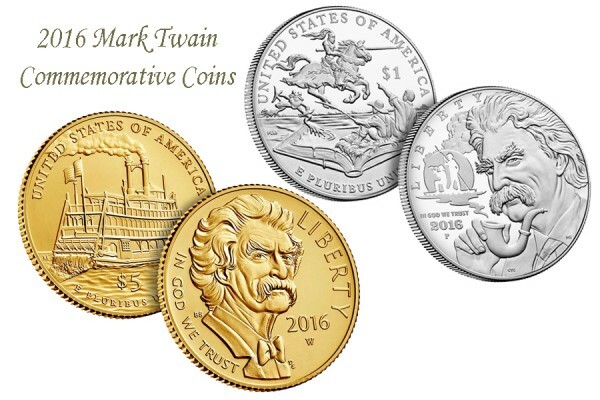 The United States Mint has released special Mark Twain Commemorative Coins for 2016. The gold coins went on sale January 14 and the silver coins became available on February 1. The Mark Twain coins will be available from the United States Mint throughout 2016 with sales ceasing on December 31, 2016. Any unsold coins will be melted down. The coins may be ordered now directly from the United States Mint. The coins were approved by legislation in 2012 which authorizes up to 100,000 of the gold five-dollar coins and 350,000 of the silver dollars to be struck. Each coin sold has a surcharge figured in the sale price. By law, the surcharges are to be collected and distributed evenly to four Mark Twain sites: The Mark Twain Boyhood Home and Museum in Hannibal; the Mark Twain Project at the University of California, Berkeley; the Mark Twain House and Museum in Hartford, Connecticut and the Center for Mark Twain Studies, Elmira, New York. The Mark Twain Museum plans to have the coins available curing regular office hours Monday through Friday for sale by check or cash only. For more information, contact the Museum office at 573-221-9010 extension 405. Each of the four sites will benefit from the purchase of these coins, whether from the United States Mint or the respective sites.